At Age One, A Tattered Reputation For South Sudan South Sudan's former rebel commanders are now government officials who are allegedly fleecing the national treasury. Impoverished citizens are angry, and efforts to recover stolen funds have not been successful so far. 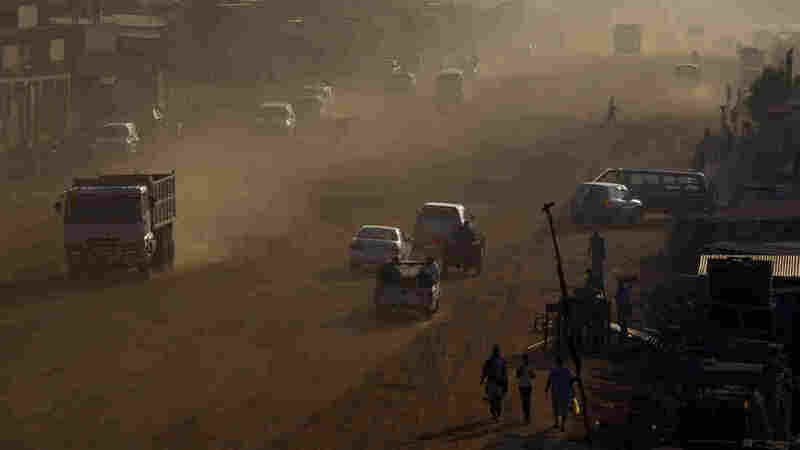 Traffic moves along a major road under construction in Juba, South Sudan's capital, on July 19, shortly after the country celebrated its first anniversary of independence from Sudan. Corruption scandals have plagued the impoverished new nation over the past year. There were hopes that the new rulers of South Sudan might somehow break the African mold of big men lining their pockets with big money. But the trend in Juba, the capital, is alarming. The infant nation of South Sudan is barely a year old, and it's already engulfed in scandals over top officials allegedly looting the treasury. Many South Sudanese citizens are outraged by the conduct of their new leaders, former guerrilla commanders who fought many years for independence. "I do see evidence of corruption in the government," says Lago Gatjal, one of Sudan's "lost boys" orphaned in the civil war. He lived in the U.S. for 10 years and returned home to help his new country. "What you see in the government is overspending of money, basically, money that goes to the ministers' pocket," Gatjal says. "If you go to their home, you find a minister living in a mansion, they are driving the best cars in this country, when the population of the country is still struggling." In May, President Salva Kiir addressed an angry letter to the nation, which concluded: "Many of our friends died to achieve freedom, justice and equality. Yet once we get in power we forget what we fought for and began to enrich ourselves at the expense of our people." Kiir says current and former officials and their cronies stole an estimated $4 billion, with most of it stashed in foreign bank accounts. A bank account opened in Kenya for the return of the stolen assets remains empty, according to a source close to the president. It's hard to imagine a place that needs public investment more than South Sudan, where the national legislative building resembles a down-at-the-heels Holiday Inn. "We need schools, we need hospitals, we need clean drinking water, we need roads, we need electricity, so that our people can change their livelihood," says Awut Deng, a member of parliament. The pilfering started soon after South Sudan formed a civil government, which grew out of a peace treaty signed with Sudan seven years ago, according to Deng. 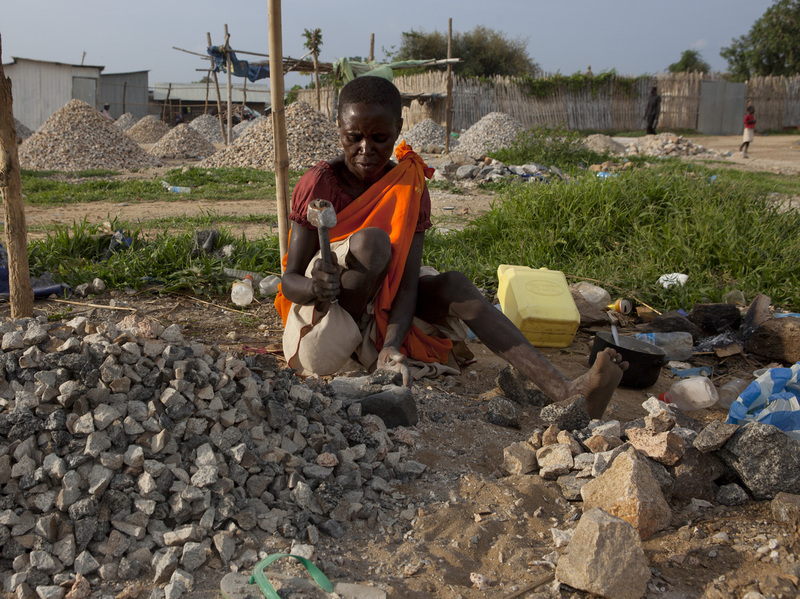 A woman pounds rocks for a few dollars a day in Juba, South Sudan. "When we came here we found that even children were on the payroll in the old system. You get double names, where you have one person being paid by four or three institutions and get the salaries, so we were able to stop that," she says. Deng resigned last year as minister of public service, she says, because she was blocked in her efforts to clean up the public payroll. A longtime Western observer says nearly all Cabinet ministers have houses in Nairobi, their children in foreign schools and fleets of pricey vehicles. The Citizen newspaper of Juba has reported on ministers ordering expensive SUVs for the purpose of reselling them. The paper has also written about a grain scandal in which fake companies billed the government for $30 million in wheat for the hungry — which was never delivered. Nhial Bol, editor and publisher of The Citizen, has been arrested three times since 2007 by security forces for accusing officials of corruption. He says the problem originates in the autocratic nature of rebel commanders. "During the years of war, all the commanders were practicing corruption in an open manner," he says. Now, says Bol, after years of fighting in the bush in dangerous, miserable conditions, the commanders-turned-public servants believe it's "their turn to eat." "It's always a massively complicated process to convert military structures into civilian ones, and it takes time, it really does take time," says George Conway, director for the United Nations Development Program in South Sudan. Time is running out for South Sudan. There's less to steal now that the nation shut down oil exports in January over a row with Sudan. What's more, international donors — which are supporting this destitute country — are urging the government to get its books in order. 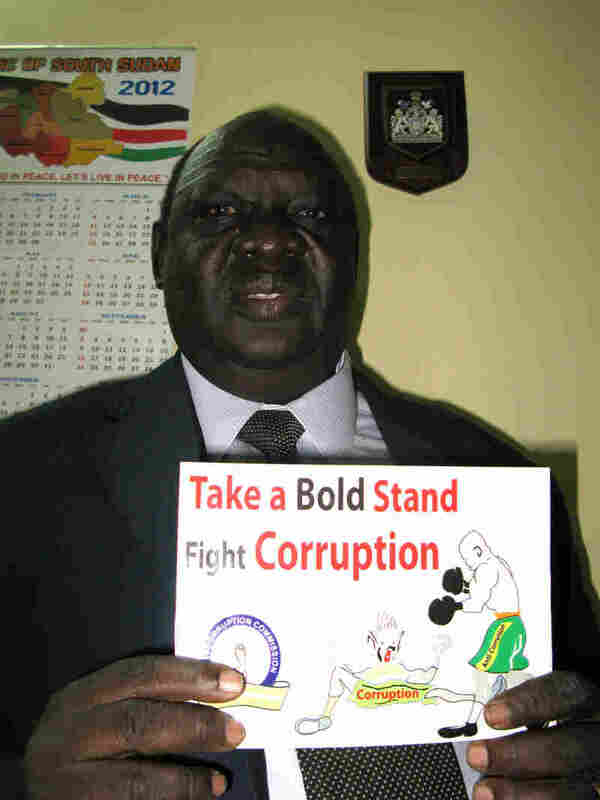 Justice John Gatwech, chairman of the South Sudan Anti-Corruption Commission, says his organization is doing its best to track stolen assets, but it lacks trained investigators and prosecutorial power. The U.S. State Department Human Rights report for 2011 says South Sudan officials "continued to engage in corrupt practices with impunity." But taking on government corruption can be a risky business in this raw-boned country. Last month, thugs abducted a civil society activist, Deng Rehan, slapped him around, interrogated him for two days, then released him. His crime? At a public meeting, he told ministers to their faces that they should not enrich themselves. After his ordeal, an unbowed Rehan has this message for his captors. "I'm now stronger, and I will not come down, and I'm now talking more and more. And it is the time [for] all of us to join our hands to make sure that our country is safe from that disease which is called corruption," he says. The South Sudan Anti-Corruption Commission says it has recovered $60 million, mainly in ghost contracts. The chairman says that to be more effective its investigators need training in tracking stolen assets and prosecutorial powers. South Sudan Vice President Riek Machar says they won't coddle crooked ministers. "We didn't agree to loot this state; we didn't agree to impoverish our population. We did not. The comrades are not above the law. Simple as that," he says. If it were that simple, South Sudan would not be earning a reputation as the world's newest kleptocracy.